Please keep in mind that this is not a security solution! Whenever possible, don’t leave your RDP port public facing! 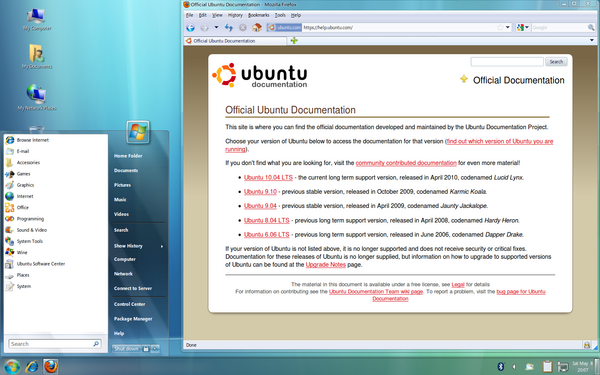 A post at TechBlissOnline.com talks about installing Ubuntu 8.04 as a virtual machine in Windows using Windows Virtual PC. I’ve found that with a few small modifications, 9.10 installs very easily as well. 2) Launch Windows Virtual PC and click on ‘Create virtual machine’ at the top of the window. 3) Name your VM, click ‘Next’, select the amount of RAM you’d like to allocate, click ‘Next’, and click ‘Create’. 4) Insert the media that contains the .ISO and launch the new VM (by double-clicking). 5) The VM will boot off of the media. Select your language and hit ‘enter’. 6) Hit ‘F4’ (for alternate starting mode) and select ‘Safe graphics mode’. 8) Select ‘Try Ubuntu without changes…’ Wait for the live session to load and then double-click the ‘Install’ icon on the VM desktop. Note: Win 7 will probably warn you that the mouse will be taken over by the VM, but it should also tell you the key combo to release it again. Remember this info. 9) Go through the Ubuntu install process as usual. 10) Eject the disc and click on ‘Restart now’. 12) Hit ‘Ctrl’ + ‘x’ to boot with the options you specified. This just feels plain wrong, but it is what it took to run Ubuntu on some temporary training machines. WARNING: This will entirely change the look and feel of your Ubuntu desktop. Please note: The gnomenu program will produce load error messages, just accept the “Yes” or “Ok” and “reload” options. This is a bug on Ubuntu 9.10. Check all the applets are in the right location on the bottom panel and then lock them in position. The final bottom panel and gnome menu should look something like the one in the screenshot below. By right-clicking on or near an applet on the bottom panel you can move it after unlocking it. Windows 7 Downgrade Rights – Warning! Windows 7 Professional and Windows 7 Ultimate include downgrade rights to Windows Vista Business and Windows Vista Ultimate. Windows 7 Professional and Windows 7 Ultimate temporarily includes downgrade rights to Windows XP Professional, Windows XP Tablet PC Edition, or Windows XP x64 Edition. Other OEM Windows 7 versions (for instance, Windows 7 Home Basic and Windows 7 Home Premium) do not include downgrade rights. Note that Windows 7 end user downgrade rights will be available for approximately 18 months after the general availability of Windows 7 (April, 2011) or the release of a Windows 7 Service Pack, whichever is earlier. Purchase a PC preinstalled with Windows 7. Accept the Windows 7 Software License Terms. Perform the downgrade or authorize an Original Equipment Manufacturer (OEM) to perform it. See additional details and FAQ. Obtain genuine Windows 7 Professional or Windows 7 Ultimate and a corresponding product key. The media should come from a prior legally licensed version from the OEM or Retail channels. Additionally an end user, who is licensed separately through Microsoft Volume Licensing (VL) programs, may provide their VL media and key to their system builder to use to facilitate the downgrade on only their systems. Insert Windows 7 Professional or Windows 7 Ultimate media in the CD drive and follow the installation instructions. If the software was previously activated, you won’t be able to activate it online. In this case, the appropriate local Activation Support phone number will be displayed. Call the number and explain the circumstances. Once it is determined that the end user has a valid Windows Vista Business or Windows Vista Ultimate license, the customer service representative will provide a single-use activation code to activate the software. In this case, the appropriate local Activation Support phone number will be displayed. Call the number and explain the circumstances. Once it is determined that the end user has a valid Windows 7 Professional or Windows 7 Ultimate license, the customer service representative will provide a single-use activation code to activate the software. Author techpainPosted on February 5, 2010 Categories OS, software, Win7, WindowsLeave a comment on Windows 7 Downgrade Rights – Warning!